Tesla’s Gigafactory 1 in Nevada is a proof of concept. Originally, the factory was supposed to be completed in 2020, have a production capacity of 35 GWh of battery cells and 50 GWh of battery packs, and employ 6,500 people. In 2017, these plans were altered publicly, as Elon Musk claimed that the company found a way to use space more efficiently and set new goals of 105 GWh of battery cells and 150 GWh of battery packs — triple the initial goals. That would also mean employing around 10,000 people when complete. The only problem is that Tesla didn’t provide a new timetable, which has led many people to assume that the factory is still supposed to be finished in 2020. Though, given the much bigger production targets, it’s actually unclear if 2020 is the end of the roadmap or not. In any case, by multiple criteria, the factory is only around 30% complete. Given the significant progress, recent updates from Tesla, and overall curiosity (and confusion) about this, we decided to dig in. We went back in time and collected all relevant news stories and reports since the first announcement of the Gigafactory. Have a look. 1* — Extrapolated projection if construction had continued. 2* — Extrapolated projection if Tesla continues construction at the pace it left off. GWh Output — 100% = 150GWh (if you use the investment scale you can substitute $15.0B for 150GWh). Qualified Employees — 100% = 10,000 Employees. What this graph shows is that the speed at which the structure was being built was exponential, until it wasn’t. Tesla stopped expanding the structure for almost 2 years. If the company resumes expanding the building right now and can pick up the speed where it left off, then the building will be completed sometime in 2020. As for the GWh battery cell production capacity of the Gigafactory, that has apparently been increasing somewhat exponentially as well. We know that Tesla reached 20 GWh of production capacity around August, and it was on schedule to reach 35 GWh by the end of 2018 last we heard. We reached out to Tesla for confirmation on this matter but did not receive confirmation or denial. 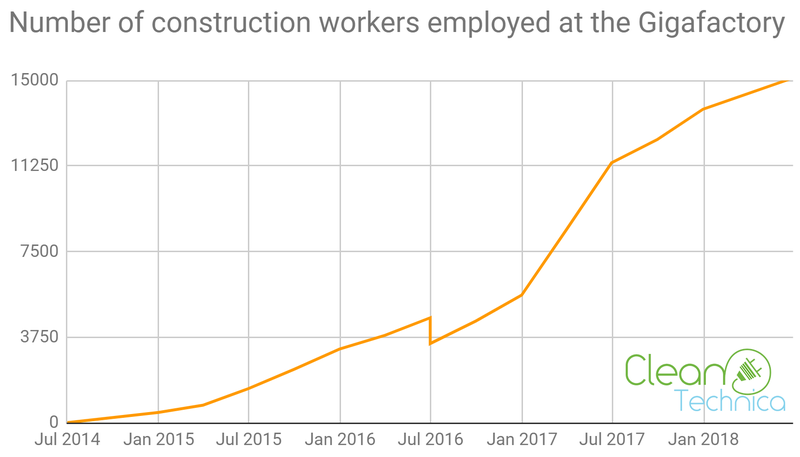 The last bit of data on this graph cover the number of people (excluding construction workers and non-qualified employees) who are employed at the Gigafactory. The number is in percent out of 100% (10,000 jobs), so as to better compare with building completion and GWh output. What we see on the graph is that up until 2018, the number of employees hired is approximately on par with building completion. Our research has revealed a few very surprising tidbits of information. A while ago, it was announced that Tesla had 7,059 employees at the Gigafactory. However, our deep dive has revealed that in reality the original 6,500 employee goal (which was later extended to 10,000) only includes “qualified employees,” while the 7,059 figure includes all employees. So, how many of the 10,000 qualified employees had actually been hired at that time? The answer is only 4,247. One of the new things we have learned from this is that, once complete, the Gigafactory will very likely employ not 10,000 people but more than 13,000 employees. This is because the 6,500 employee figure (and by extension the 10,000 employee figure as well) only includes the qualified employees. If you also count the current number of non-qualified employees, you get around 13,000. 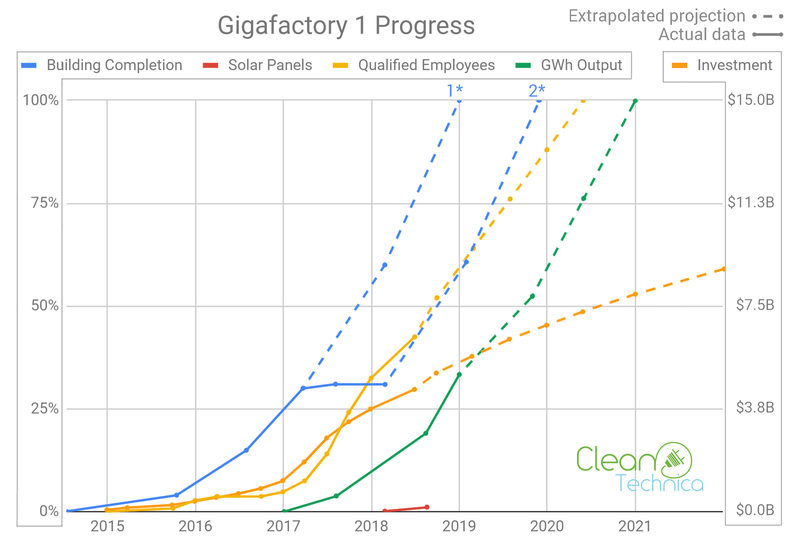 While there is insufficient data to confidently conclude how many non-qualified employees there will be at the Gigafactory once complete, if today’s figures represent an accurate ratio, then it could very well be that when complete, the Gigafactory will employ more than 15,000 or 16,000 people. You might be wondering what that strange drop in July 2016 is all about. We have included this on purpose to shed some light on a few discrepancies in the data we have stumbled upon. Until July 2016, the Nevada’s GOED (Governor’s Office of Economic Development) published quarterly reports on qualified employees and investments made into the Gigafactory. At first glance, it seemed like they were over-calculating the number of employees and at times misplaced up to $2 million of investments per quarter until it became clear that they were publishing unaudited data and that such adjustments are normal. After Q2 2016, Grant Thornton, an auditing company, took over the reporting, and while they published a lot later and the numbers were lower, they were apparently more accurate. If you pay close attention to our first graph in 2016, there is also a slight decline in qualified employees that has to do with the same transition. While mathematically the extrapolated projection is accurate, in reality, the final 15–25% might end up looking a bit different. If the Model 3 ramp is any indication, it’s way harder to hit those final percentage points. The biggest difference is that in Fremont Tesla is running out of space and needs to find a way to cram it all in. At the Gigafactory, Tesla could simply expand the building a bit more and add additional production lines and not invest all that effort into speeding up existing lines to hit some arbitrary number. 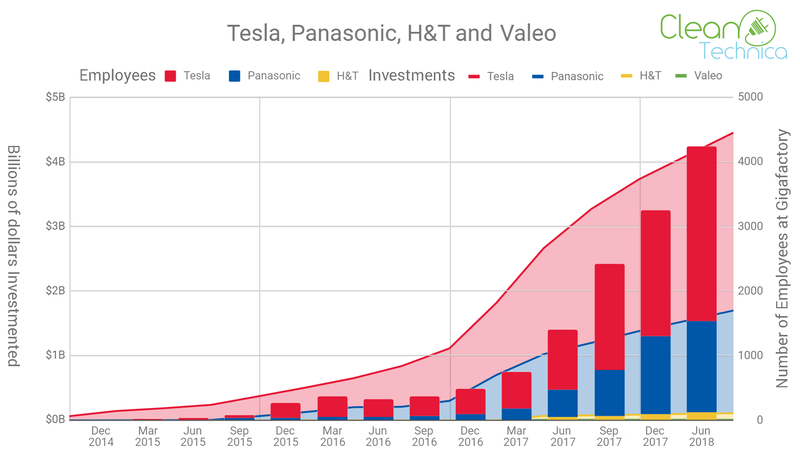 Not to clutter up the first graph, we have kept the division of employees and investments between Tesla, Panasonic, H&T, and Valeo separate. For those unfamiliar with H&T, “Heitkamp & Thumann Group is a leading global partner for the supply of world class precision formed components in metal and plastic.” It has invested $99 million since Q2 2017. Valeo is an “Automotive supplier” that has thus far only invested $9 million once, in Q2 2017. Tesla has invested a total of $2.754 billion and Panasonic has invested $1.591 billion. In total, $4.453 billion has been invested into the Gigafactory. As per our first graph, the total investment is likely to be between $7.5 billion and $10 billion. The math says $7.9 if they finish before the end of 2020 (as per the original schedule) or $8.8 billion if they finish a whole year later. At this point, it’s unclear if Gigafactory 1 will be completed before the end of 2020. However, if everything goes well and follows the trend lines, it is possible. Our current theory is that all this time Tesla (together with Panasonic) has been developing better battery lines and better batteries. Once satisfied, they will simply have to copy & paste that new design, so that might make matters a bit simpler. In this case we will suddenly see a lot of rapid progress. The only question is when this turning point will be. The fact that Tesla has recently made a new parking lot indicates that this turning point could happen at any moment. Some of the haters might again try to say that the Gigafactory timetable was planned using the patented “Elon time” metric and has resulted in delays. Despite any delays (if there will be any), production capacity today appears to be approximately the production capacity originally targeted for 2020 — quite an early arrival. Tesla is building the biggest battery factory in the world, becoming the biggest battery manufacturer, and trying to “accelerate the world’s transition to sustainable energy.” In perspective, this is critical to the future of humanity, and critical to averting catastrophic climate change. So let’s be thankful this project is rolling along so quickly. For those who are interested, below is a satellite picture of the Gigafactory showing approximately when each section was completed. Underneath that is a timeline of various Gigafactory 1 related milestones, events, and announcements. Here is a link to Nevada’s GOED website that contains all the reports they have published over the years. January 1 – Gigafactory battery cell production capacity now at 35 GWh? If you have any questions about this article or the data, let me know in the comments below or on twitter via @ChananBos.